Today I thought I would share with you how I up-cycled my canvas shoes into the coolest runners around, as it is super easy to do and the results are crazy good! I’ve seen many tutorials to custom footwear using Sharpies and fabric paints, but using Sharpies on these is asking for trouble in a rainy place like Scotland (they need to be lacquered if you’re doing that ), and although I’m keen on fabric paint, I wanted to do something a little more adventurous for this project… So we’re going to stitch them! 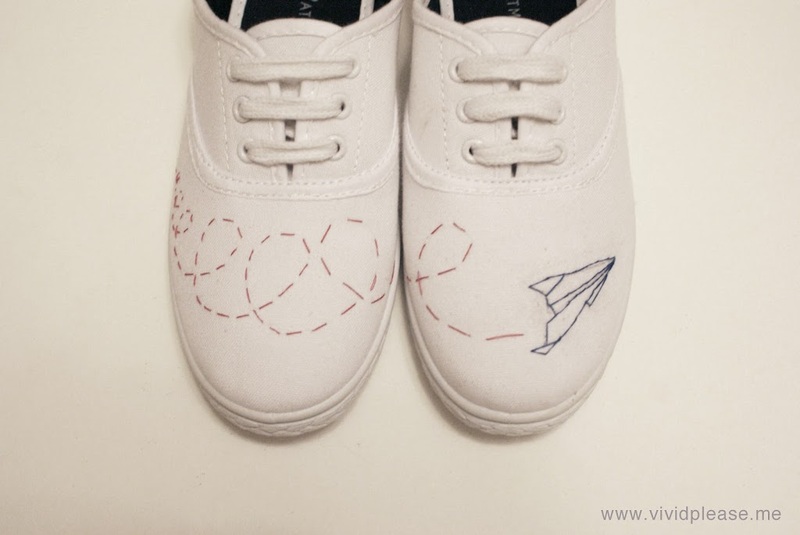 Start out by lightly marking out your pattern using the pencil. 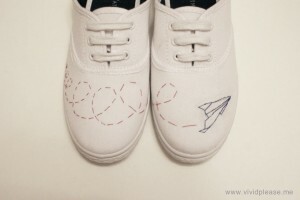 I’ve decided to have a paper plane flying across mine (I love to draw these!) so I’m going to have two different feet 🙂 If you want to have two the same, I suggest drawing out your pattern and using tracing paper to get them to match. 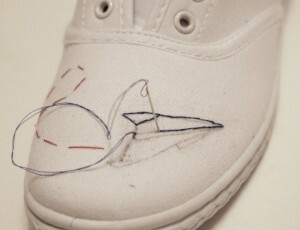 If you are struggling to trace onto the shoe, you can pierce through the paper with your pencil to use as guidance. 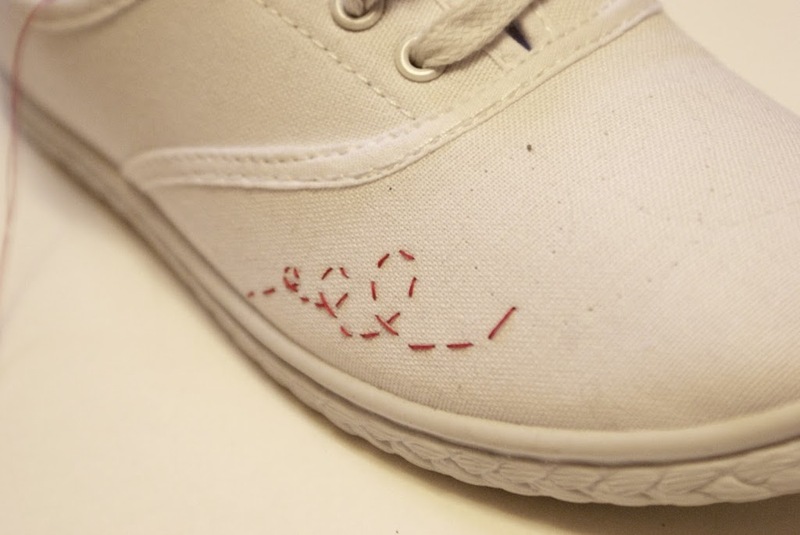 It’s better to draw directly on the shoe if you can because they aren’t flat and you want your stitch work to look right when it’s done. You can always change it if its not going as planned as it’s just pencil and a threaded needle; you can rub out and unpick if you need to – take that inky projects! Bear in mind that you will have to get your hand in the shoe to push the needle through, so don’t go too close to the toes and edges as it gets tricky down there! 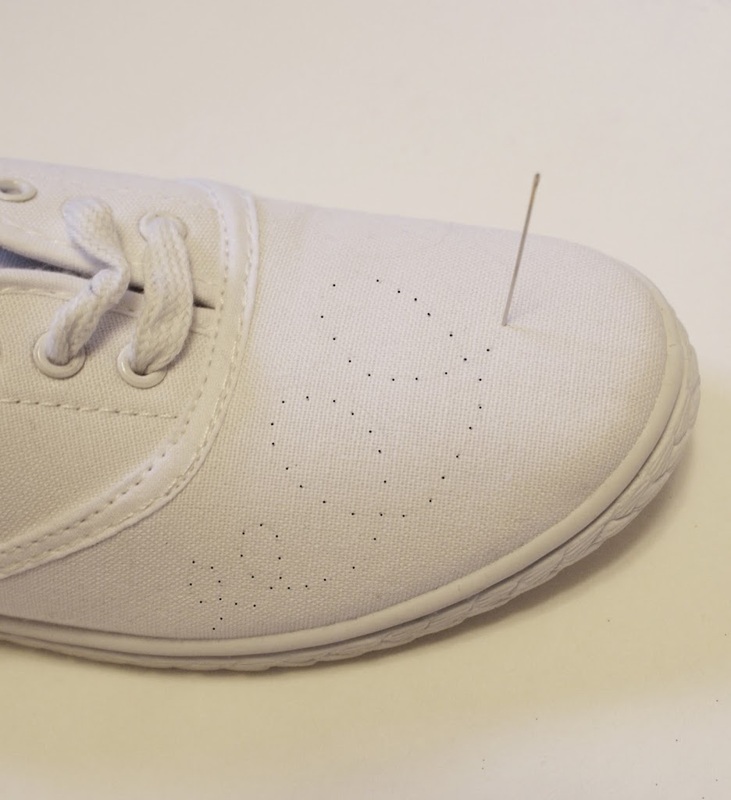 Next, using your pin (and with help of the thimble if you need it), pierce holes into the canvas where you want to stitch through. This will make it that little bit easier to get your needle and thread through. If you are finding it hard to use a normal sized needle, use a thicker one (like an embroidery needle), to make the holes. When you have everything marked out, thread your needle and tie a few knots at the end of the thread. 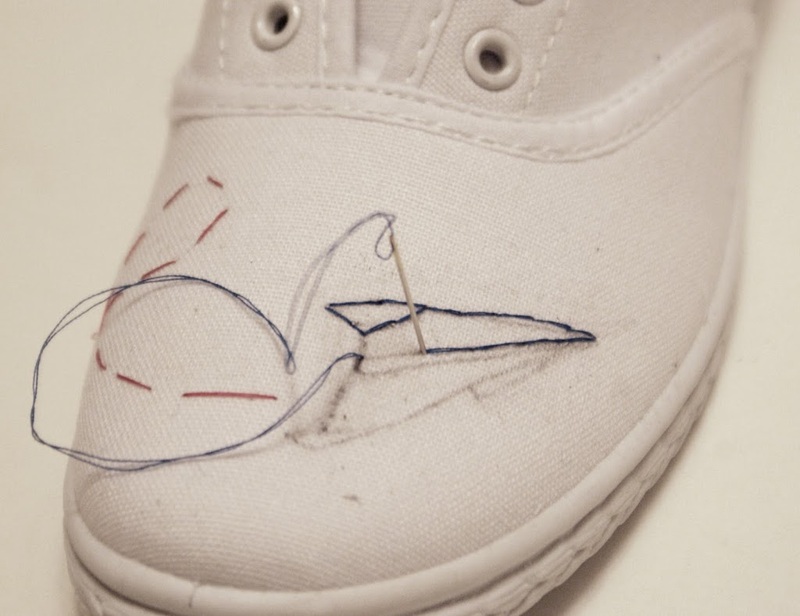 Start your pattern at the very first hole and work from the inside of the shoe – you don’t want the knot to be visible when they are on. 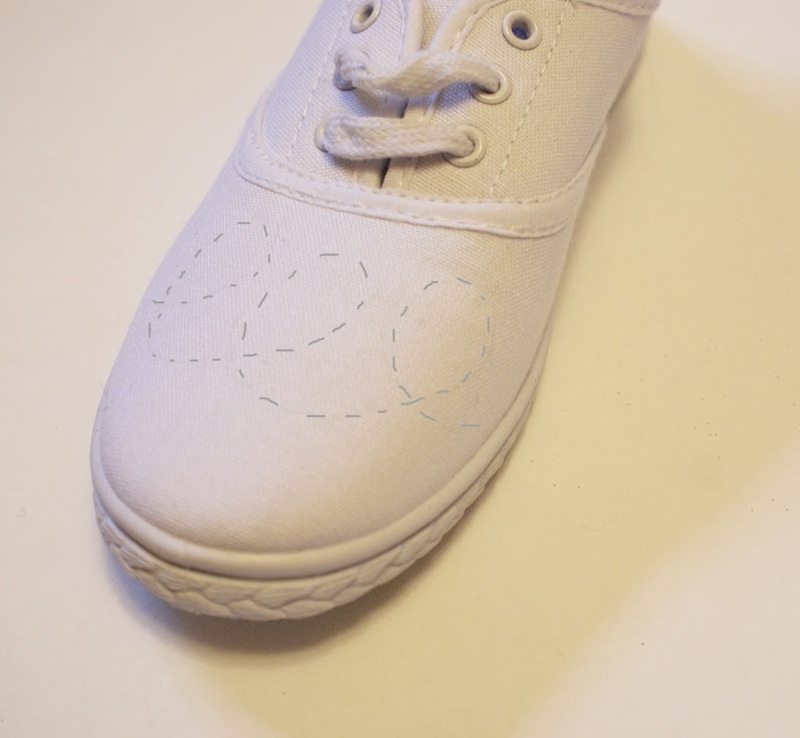 Then carefully stitch through your marked holes and watch the magic shoes come to life! As you can see, I’ve taken the shoe laces out as it gave me more room for fitting my hand in there. All is well and we are half way there already 🙂 Tea break and back to work! Awesome, right? 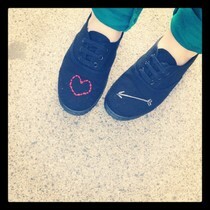 Now whenever you’re looking at your feet, you’re going to have something amazing looking right back at you 😀 And if you’re feeling really special, you can add some beads to bling them up too! Come rain or shine, you won’t need to worry about these custom shoes. Winner!! 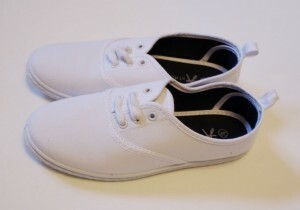 I’ll be getting myself a pair of canvas shoes shortly! Awesome! We’d love to see how you get on 😀 good luck! I loved this tutorial!!! Thanks for sharing! 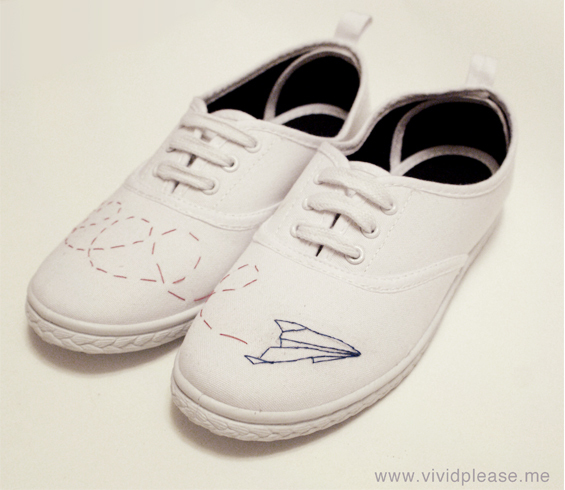 I actually quite like your paper airplane idea and might use that one! 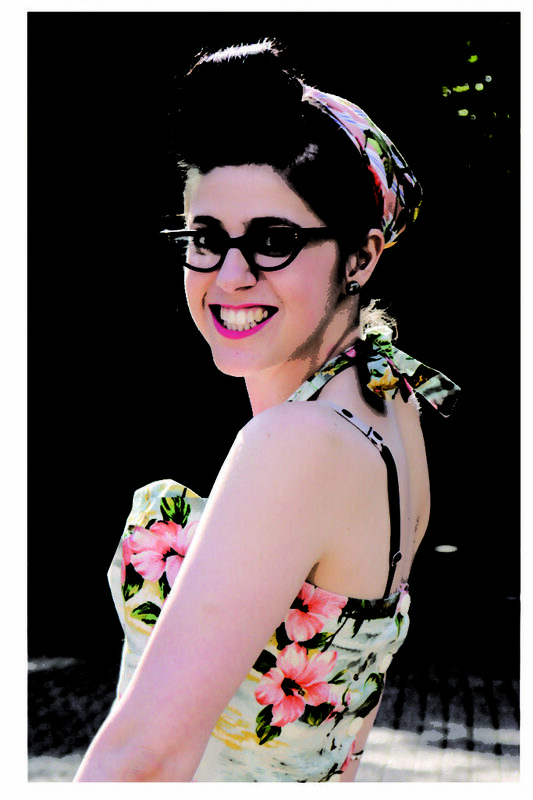 Thanks ChatterBlossom, we’re so pleased! We’d love to see your version so send us a link when your done! Great idea! And the how-to-tutorial is well written, thank you! Thanks Claudia! So great to hear it’s been written well, thats always the challenge! Thanks Ana! To be totally honest, these are crazy easy to do. The black shoes took me about 15 mins and the paper plane ones took me about 40 (because of all the loopdeloop stitching). For the amount of money spent on custom runners, they are time well spent 😀 So glad you like the tutorial! Ooh!! I love this idea!! A simple and inleetiglnt point, well made. Thanks! I love this tutorial about your up-cycled canvas shoes! 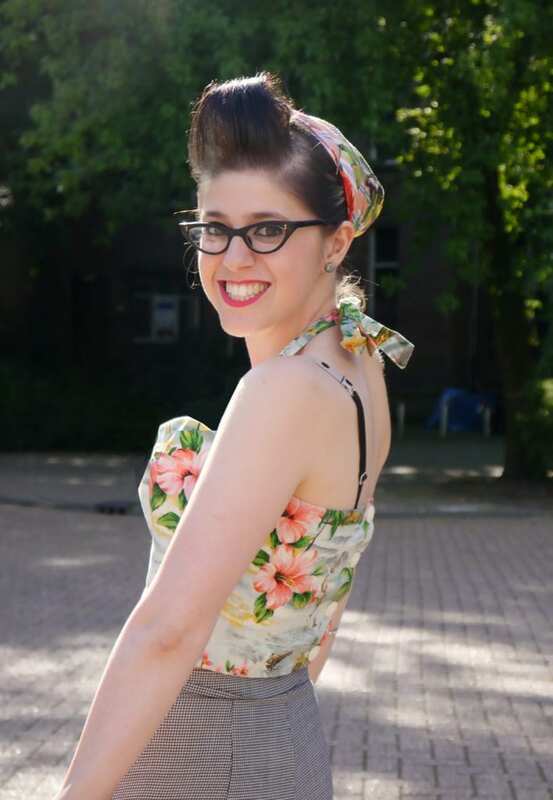 Your blog is fresh and inspirational – I look forward to seeing more stuff! You are awesome! There really isn’t anything else to say. New fav blog! !